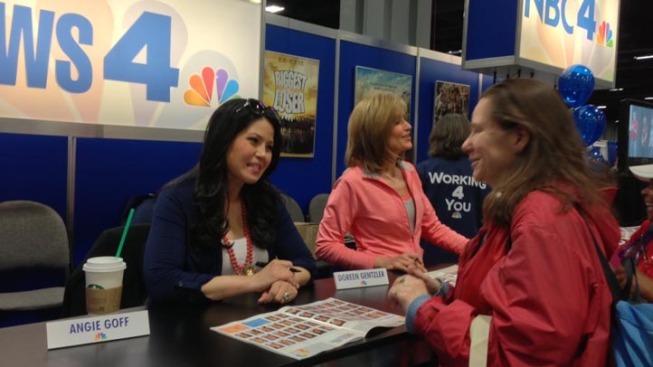 News4 anchors Angie Goff and Doreen Gentzler greeted fans Saturday. This weekend, NBC Weekend Today anchor Erica Hill and meterologist Dylan Dreyer will join the fun at the NBC4 20th Anniversary Health and Fitness Expo! Hill and Dreyer joined Weekend Today just one month apart in fall 2012. They will fly from New York after Sunday's Weekend Today broadcast; you can see them at the Expo between 2 p.m. and 4 p.m.
Of course, you can also see many of your favorite NBC4 anchors, reporters, and meterologists taking pictures, signing autographs, and reporting live at the Expo this weekend. The 20th anniversary celebration of health, fitness, and fun is FREE and runs from 9 a.m. to 5 p.m. Sunday at the Washington Convention Center.